Watching MotoGP live in Italy has always been on my bucket list. The rivalry between the Italians and Spanish riders has always been intense. I can only imagine images of Christians being fed to lions at the Colosseum in terms of atmosphere. I’ll report whether otter’s noses are sold at the stands. Misano is the home circuit of 20yr veteran racer Valentino Rossi who won the race last year. Today I managed to visit Rossi’s home town Tavullia, a stone’s throw from the Adriatic Sea and the Misano Circuit. The entire town is wrapped in “46” paraphernalia. He has a restaurant, bar, VR46 store, fan club and even sells da Rossi olive oil to his loyal minions. It was flooded with fans on Friday. He even lives there and trains on his moto ranch. It’s easy to see why Yamaha pay him €12mn a year with €10mn in endorsements from Dainese and Monster Energy. He’s a marketers’ dream. He also invests in the next generation of Italian riders via the VR46 Riders Academy and no doubt takes a nice clip out of them in management fees – Baldasarri, Bulega, Migno, Bagnaia, Antonelli, Marini, Di Giantonio, Morbidelli and so on. He puts back into the sport which many other riders don’t. This is why Rossi is so pivotal to the crowds at MotoGP as he embodies the sport. He is so popular the Spanish crowd booed an all Spanish podium where the Spanish King had just crowned the Spanish world champ in Spain. His rival and team mate Jorge Lorenzo is headed for Ducati next year, which looks to be a massive mistake, even suggested by KTM’s CEO. I agree. Lorenzo can’t ride in the wet and the Ducati is an untamed beast compared to the well sorted chassis of the Yamaha M1. It will be even worse in 2017 when the winglets are banned as the Ducati has front end stability issues. Lorenzo broke a cardinal rule in the Japanese team. As the championship went to the wire Lorenzo looked to get his senior (Sempai) sanctioned by the officials on a technicality to ensure he could win the 2015 title. At the last race, Yamaha knew either Rossi or Lorenzo would win the title but decided to cancel the victory celebrations if Lorenzo won (which he did) because of the disrespect to Rossi. Yamaha knew it was Rossi alone in 2004 that put them on the map. Yamaha had a rubbish bike and Rossi hated the control within Honda. Rossi wanted to show that it was the rider and not the bike, contrary to Honda’s arrogance. His then rival Max Biaggi said the Yamaha was rubbish and needed a Honda to win. Rossi not only won the last race and the championship in 2003 with Honda he became the first ever rider to win the first race and championship on a new manufacturer. He won four more titles with Yamaha – 2004,2005, 2008 and 2009. Yamaha never forgot what he did for them. I look forward to heading to the Colosseo tomorrow. Want a great read? Here it is. 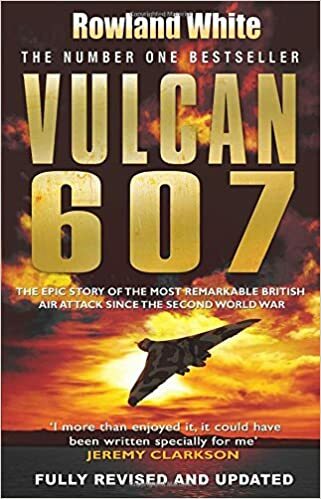 Vulcan 607 is the true story of the RAF bombing the Port Stanley airfield in the Falklands War in what was called Operation Black Buck. If you want to learn about execution of a plan when you don’t have all the tools at your disposal this book shows what can be achieved. It should be compulsory reading for millennials to show them life is not always simple and requires more than an app and WiFi. This was the longest ever bombing raid at the time. It involved using what was left of a knackered air force tired aerial tankers and Vulcan bombers close to be put out to pasture due to their age. No satellite GPS positioning, no fancy digital. All done with slide rules and a calculator the night before the raid. Before the raid, budget cuts meant few parts were available. Many missing parts like refueling valves (which had been filled with 20-year-old cement) were scavenged from other Vulcans that had been donated to museums and the bomb racks were reclaimed from scrapyards. A seal for a new radar-jamming device was improvised from corks from a home-brew beer kit and another crucial component was discovered in the engineers’ mess, serving as an ashtray. Having broken a refueling probe during refuelling practice they managed to find the only one left in an old supply depot as the maker had gone out of business. So next time your staff complain at what they don’t have, perhaps worth considering what can be done against the odds if one tries. Hillary’s French Connection to ISIS? Documents obtained by several investigations reveal that Lafarge has paid taxes to the terror group to operate its cement plant in Syria, and even bought ISIS oil for years. Most of these emails seem to have been first obtained by Zaman al-Wasl. Lafarge’s Syria operations ended on that date when Isis took over the firm’s facility in Jalabiya. Documents show that Lafarge’s Paris headquarters were fully aware of the business deal with Isis. The company even sent a representative into Isis territory “to get permission from Isis group to let employees past checkpoints,” reports Le Monde. A “pass stamped with an Isis group stamp and endorsed by [Isis] finance chief in the Aleppo region” confirms Lafarge’s deal with Daesh to allow the free circulation of its goods. In February 2015, Isis were driven out of the Jalabiya region by Kurdish forces. Lafarge has declined to address the allegations, stating only that the firm’s highest priority was to protect the safety of its employees in Syria. However, instead of ending its Syrian investments when the conflict began as most other international firms had done, which would have been the safest option, the firm struck a lucrative business deal with the jihadist terror group to maximise profits from its local cement operations. Among its earliest benefactors was former First Lady and current presidential hopeful, Hillary Clinton. Of course at the moment they are allegations and proving Hillary Clinton had the inside track on all dealings by Lafarge is a moot point. However this type of sensationalist leak with headlines likely to be the only things people read into the scandal, once again paints a very bleak picture of her already non-existent trustworthiness. Tales out of school. When I worked as a defence analyst in the UK I got to meet many interesting people from military and national security apparati. One of my greatest recollections was talking to one chap on during Operation Desert Storm where most of the enemy weapons stockpiles they found in Iraq had “Fabrique en France” stamped on them. The illegal arms trade is a huge industry and there is no way on earth that security agencies like the CIA were in the dark over French weapons supplies. The question remains how does Hillary Clinton wipe fingerprints clean from the smoking gun. She can deny til the cows come home but her credibility is already shot and Trump will use every opportunity to connect her to ISIS, elites, fraud (you name it) which takes air from her campaign. Trump’s recent brain snaps don’t do him any favors but one imagines Assange is leading Clinton into a trap of denying any allegations before publishing emails reveling the divisiveness. Things may seem dirty now but I think this is the end of the beginning not the beginning of the end. A fantastic video on the Paralympics. Very heart warming and truly amazing to see the spirit of those who seemingly have no disabilities.